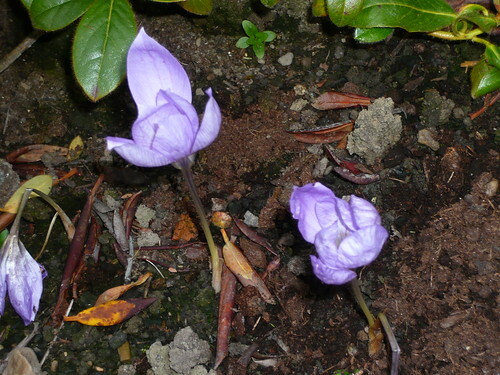 After seeing Naked Ladies at Harlow Carr gardens in Harrogate I decided to plant some Autumn crocus for myself. The blue Crocus speciosus were planted under some rhododendron shrubs and the colour has been a good strong blue. The corms would have flowered without being planted so it is little to do with the peaty soil but hopefully the leaves that follow the flowers will now help bulk up the Crocus for future years. 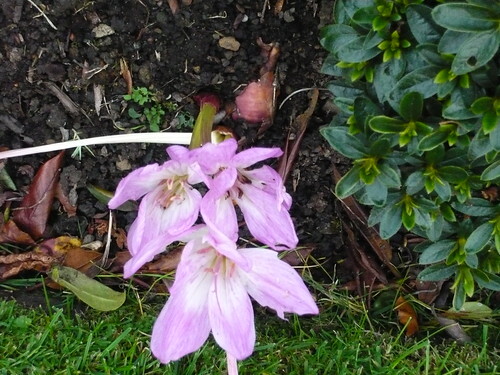 The blown flowers on the pink crocus were from far larger bulbs. As you can see they are too near the surface but many Crocus have the ability to use their roots to pull the bulbs deeper in to the soil. I will not be disturbing them to find out. I will cover with some more soil if only to deter mice from eating the bulbs. Even now if you find bulbs on sale or special offer it may be worth buying some of these interesting bulbs.